Financial institution, Stanbic Bank Zimbabwe, has purchased an assortment of Non- Food Items (NFIs) worth over US$70 000, to fight against cholera. The government declared a state of emergency after 20 people died of cholera. At least 49 people have died from cholera and 9 779 cases have been reported in the last three weeks. 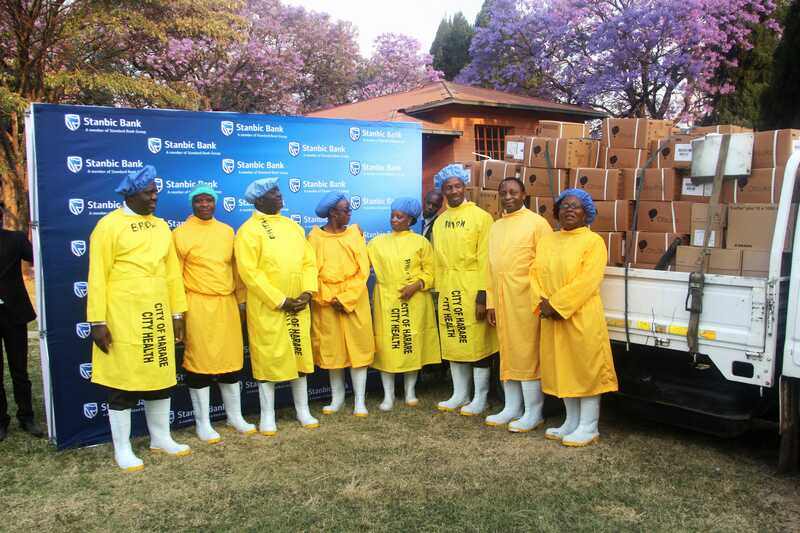 Stanbic Bank Head of Marketing and Communications, Palmer Mugavha, speaking at the handover ceremony that took place at the Beatrice Infectious Hospital, said the plastic aprons, latex gloves, face masks and pairs of gumboots are for use by healthcare workers while the 25 litre containers and water treatment tablets are to be distributed to various households in affected areas. “As we stand here we are deeply saddened by the impact the cholera pandemic has had on families and friends and the nation as a whole. We are saddened by the deaths which have been recorded and attributed to the cholera pandemic and we extend our sincere condolences to all who have lost their loved ones. “We are here today as Stanbic Bank to join the government, members of the Non-Governmental Organisations, the communities and fellow corporates in curbing the further spread of this ruthless plague,” said Mugavha. Mugavha urged the populace to adhere to the preventive measures as guided by the Ministry of Health and Child Care as it is well known that “prevention is better than cure”. “We appreciate the government and the Ministry of Health and Child Care’s swift response and efforts in coordinating the strategic reaction towards preventing the extended impact of this pandemic,” said Mugavha. The Deputy Minister of Health and Child Care, Dr John Mangwiro said the government was committed to ensuring that there was no more loss of life adding that the donation by Stanbic Bank would go a long way in ensuring that this is achieved. The goods that were donated include 5 000 litres of IV fluid; 5000 x 25 litre containers, 10 000 plastic aprons, 50 000 face masks, 10 000 latex gloves, 100 pairs of gumboots and water treatment tablets.